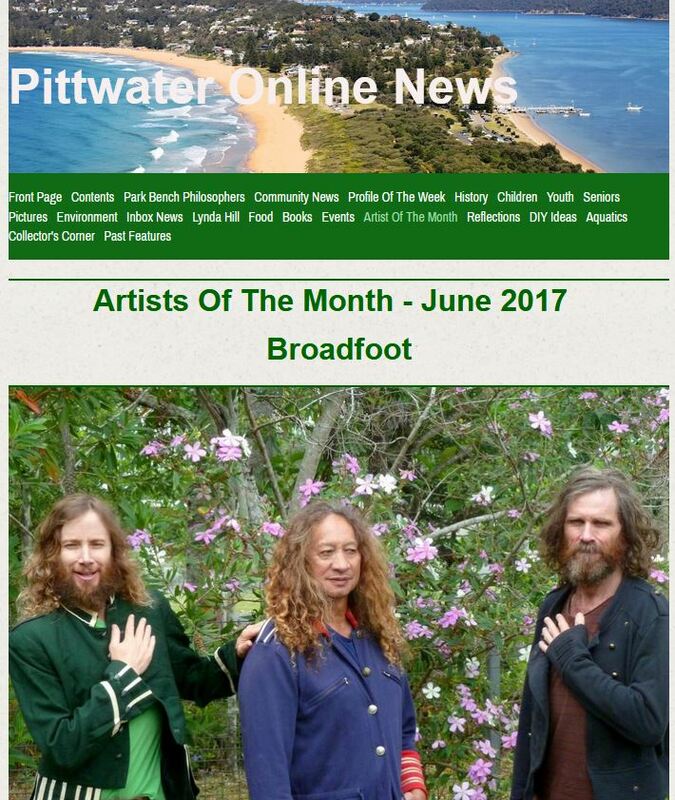 We're honoured to feature as Artists of the Month in the June 2017 issue of Pittwater Online News (Trent being the Pittwater connection) - the article explores our new album in depth, as well as giving interesting insights into the evolution and ethos of the band. Broadfoot would like to give a big thank you to Robert Yongco from Digital Electronics in Mullumbimby. For years Broadfoot have had a wonderful oil lamp type projector that has added to the vibe of our night time gigs. The motor needed replacing but the parts for this projector were no longer being made. Robert found a motor that fit and then customised it, devoting much care to the task and thankfully it is back in working order! This type of lighting complements the music of Broadfoot and in the digital age manufacturers have unfortunately overlooked the demand for such lighting effects. Broadfoot would also like to give a big thank you to Paul Robinson at CR Steel Fabrications in Mullumbimby for ongoing maintenance and repairs on the metal work of Trent's drum kits. Constant gigging puts a lot of strain on the parts of a drum kit, especially as many are around fifty years old. Trent would rather have a fantastic drum being heard, letting the world appreciate what it was designed for, than have it stored in a museum without being used! 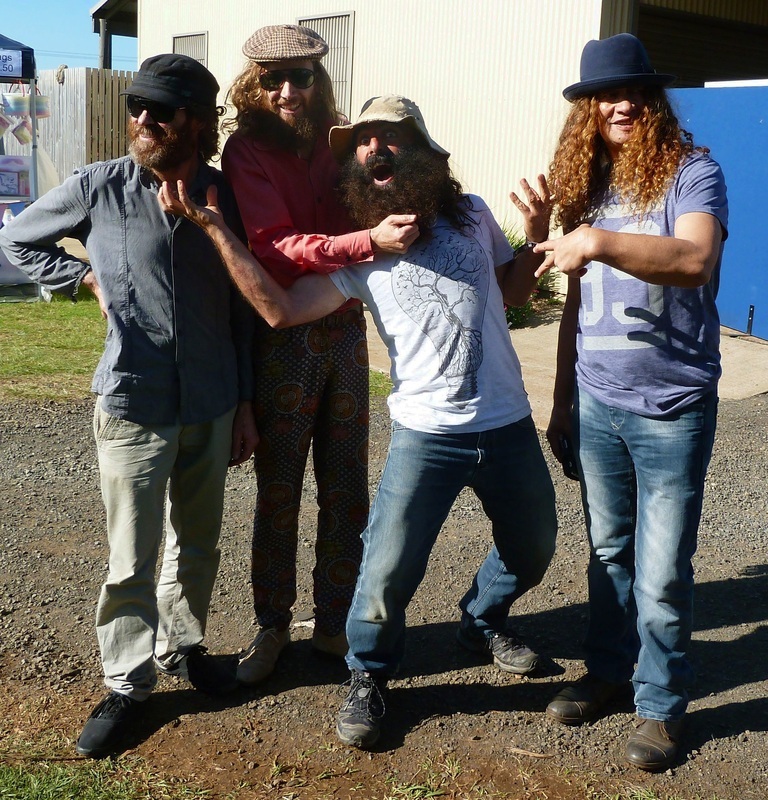 Broadfoot had a fantastic weekend playing at Bangalow's Sample Food Festival, and the following Sunday afternoon on the Main Stage at one of the region's biggest annual events, the Summerland Country Fair out at Alstonville's beautiful Summerland House Farm. Thanks to everyone who bought CDs and nearly cleared us out! It was a real pleasure for the band to meet Costa Georgiadis and compare hair and beards after the gig. Broadfoot are proud to have been awarded the 2011-2012 Dolphin Award (above) for best Indie/Garage song for John's eccentric masterpiece 'She Bites Me'. 'Ocean' also received kudos with a finalist nomination in the Rock/Metal/Alternative category. Both tracks come from the 'Straight Between Us' album. In October 2012 Broadfoot played at the Lismore Show as part of the NCEIA showcase. The music was broadcast live on Lismore's River FM and sounded as good on radio as it did on the stage, which was decked out spectacularly with props and an excellent lighting show. Thanks to NCEIA for organising the event and to Gary for the photos (above). Broadfoot's music features on the soundtrack of the 'No Direction' DVD packaged with edition #256 of WAVES - compelling footage of ASP World Junior Champion Caio Ibelli flows in perfect unison with the track 'Ocean'. In November 2011 Broadfoot performed live in the 2 TLC-FM studio, Yamba's community radio station, playing some of their own songs as well as some covers which were to be on display at the Pacific Hotel later that night. Broadfoot were interviewed by Gary and Stu and the vibe was fun. Some tracks from Broadfoot's studio recordings were also played and discussed. The studio was small, just enough to allow acoustic guitars, a small bass rig and hand percussion. It was very amusing watching Stu having to crawl out on his knees in between Broadfoot band members as they performed in order to move elsewhere in the studio. The live results can be enjoyed here. Congratulations to Trent on his inclusion in Ingo Winterberg's definitive Trixon Drums website. Trent can be found flying the flag for Australia in the international showcase of jaw-droppingly magnificent vintage Trixon drums . . . click on the 'drumsets' tab and then 'Luxus' on the left . . . scroll down to where the flags are waving and click on Trent's purple sparkle Luxus kit to go through to his page. Broadfoot's track "Ocean" is track 11 on the "Jack, Jill & Coke" compilation published in 2011 by Off The Record in conjunction with Drum Media. This way please to download the full album. BROADFOOT'S 13 TRACK 2nd ALBUM "STRAIGHT BETWEEN US" IS AVAILABLE TO PURCHASE AND DOWNLOAD IN A DAZZLING CHOICE OF HIGH QUALITY AUDIO FORMATS HERE.